I can’t remember who taught me about the napkin button-hole. I think it was my father, after all, he took to the buttonhole napkin immediately on our last Lufthansa First Class flight. It is truly a marvelous invention, and I can tell you that many spills did not make it to my shirt because of it. The buttonhole napkin in its glory on American Airlines. You see, there is this buttonhole in some napkins. 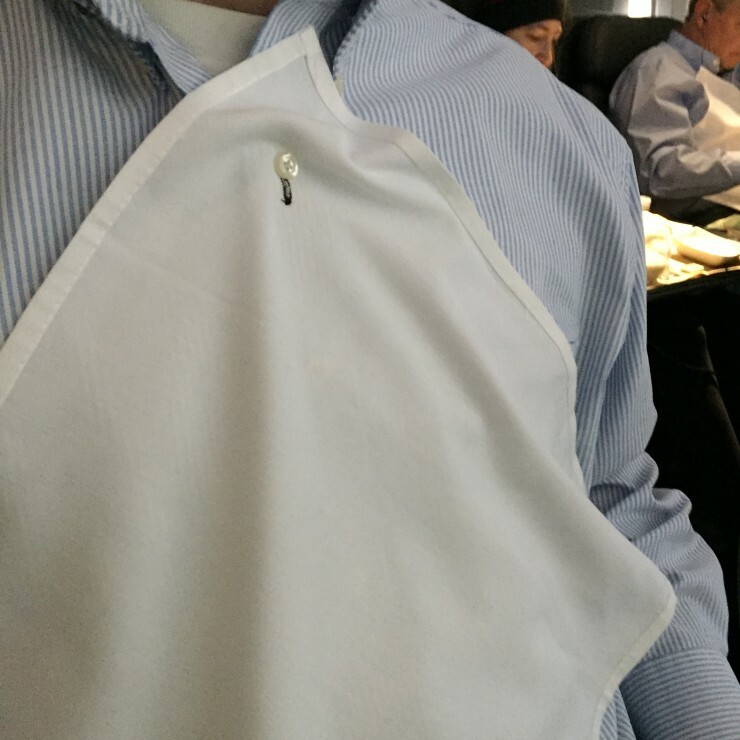 The idea probably harkens back to when folks would stuff the napkin in the neck of their shirt. Well, someone came up with a better way, put a buttonhole, that folks who are wearing either a button down shirt, golf shirt, or really any shirt that has a button somewhat close to the neck, can just put the napkin on that, rather than stuffing it in the neck of their shirt. I know what you are thinking – this is trivial thing, and it’s just better to not spill food on your shirt to begin with. But you see, between turbulence, and general goofiness, I need this buttonhole. 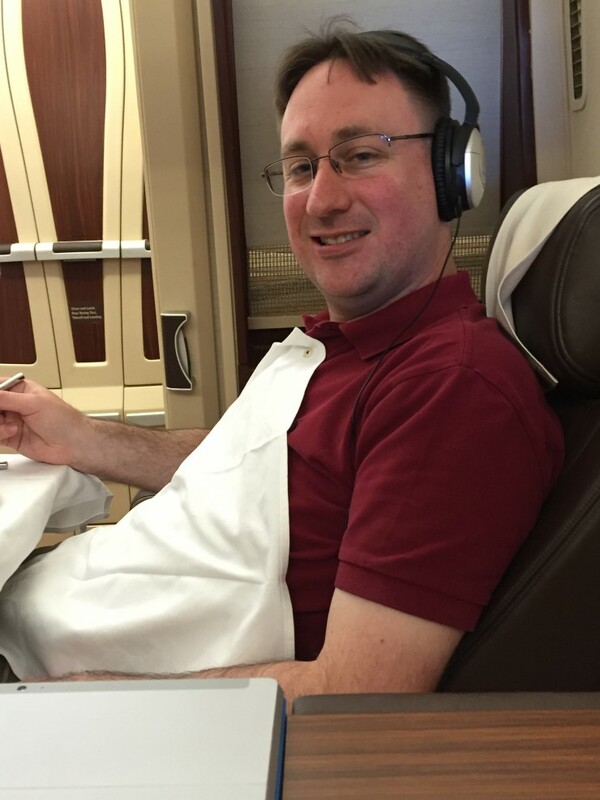 In fact, as I wrote this post, I’m sitting with my napkin still firmly attached to a button on my shirt. Sporting the buttonhole napkin, and look, in the background another is doing the same! In fact, back when I took my brother and father to the Christmas markets, I shared this amazing human innovation with my brother. He took to the buttonhole in the napkin very quickly, leveraging it on the flight I mentioned it on, as well as the following flight. Yet then we got onto an intra-Europe “Club Europe” British Airways flight, and, to our chagrin, there was no buttonhole. I still remember each of us going corner to corner to corner to corner of the napkin provided, with greater dread with each passing corner. When it became apparent, we were faced with a difficult decision. Do we do what our ancestors did, and just stuff it in the neck of our shirt? Or, do we risk it, and just use the napkin on our lap. This was perhaps my greatest quandary in December. I’m still not sure if I chose wisely! 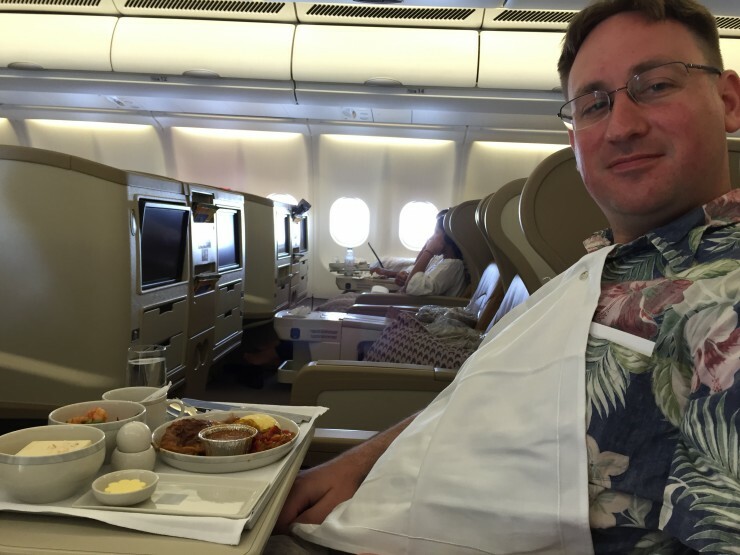 All I can say is that I luckily didn’t spill any of that wonderful clotted cream or jam on my shirt, from our Club Europe British Airways afternoon tea meal service. Singapore A330, had to protect the aloha shirt! With that, I would submit that the napkin buttonhole is an innovation that deserves a Nobel Prize, or at least a PF Digest Award! Have you ever noticed the buttonhole? Have you ever taken advantage of said buttonhole in the napkin? Has this ever saved you from certain doom of a stained shirt while traveling? Please, share your conquests over food-stained shirts in the comment section. Love it! Though, I’m not sure the guy in the background of the first picture is using it properly. I think he’d have better napkin over shirt coverage if he was using the buttonhole. 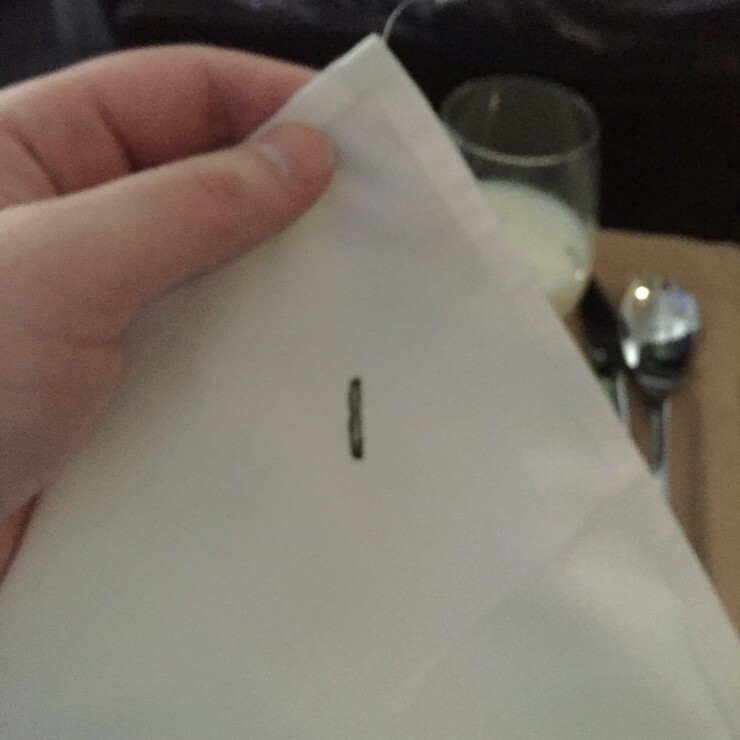 I always use the buttonhole napkin; but on a recent Delta flight my girlfriend reprimanded me saying it was improper. She is no longer my girlfriend. Knew it was special I just couldn’t remember why.